Quality Assurance | Columbia Steel Casting Co., Inc.
Quality control is more than a final inspection. 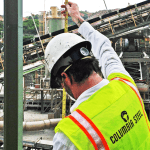 It is a fundamental responsibility of everyone at Columbia Steel. We evaluate wear part quality based on casting structural integrity, alloy selection and formulation, heat treatment, and dimensional accuracy of assembly and working surfaces. Once a sample part is tested and approved, its production continues to receive scrutiny by our Quality Assurance Department. Product performance tracking, manufacturing documentation, and our own high production standards mean our parts are guaranteed for proper fit, performance and customer satisfaction.